Tour France or Tour de Crash? This entry was posted in Comments about Cycling on July 3, 2015 by Steve Tilford. I read a good article that Bauke Mollema wrote about the Tour and riders safety. It is spot on. And since the Tour starts tomorrow, in Holland, where it could be crosswinds, this is a good time to address the elephant in the room. The riders and the team managers need to address the issues with all the crashes that have historically happened early in the race because when you really look at the situation closely, they themselves have escalated the danger of the race. I don’t disagree with anything that Bauke mentions. He is correct on all observations. The danger exists because there is not enough space for all riders at the front. And the team directors are on the radios telling all their riders to be at the front, which again, is impossible. The peloton needs to be more concerned with safety. Trying to stay in line, on a team mate’s wheel, in the middle of the pack is just plain stupid. 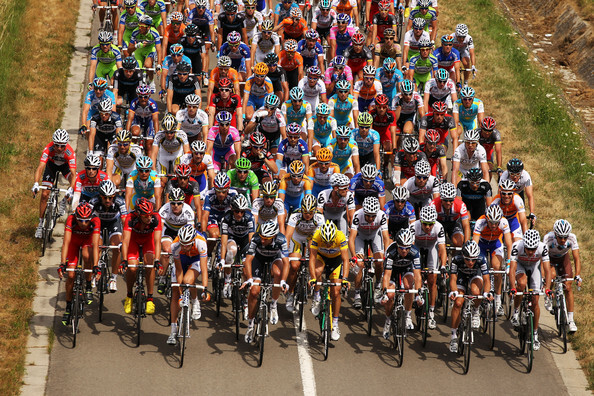 Fighting for position in the middle of the peloton is just plain stupid, early in the race. It does nothing but endanger all the riders around you. When I went out to Colorado three years ago and “witnessed” some pre-race testing of the Garmin team, from Jonathan Vaughters’ invite, a lot of what Tom Danielson and Christian Vande Velde talked about was being scared shitless about the first week of the Tour. Could they survive the carnage that was going to for sure happen? I never remember, ever having these thoughts in any race I started. Everyone recognizes the problem, just no one or no team wants to say uncle and change the way they ride. Everyone has to change their tactics. Most places during of the race, or coming into technical sections, there isn’t enough room on the road for all 200 guys. So a lot of them end up on the ground and out of the race. This is a relatively new phenomenon. Definitely since the inclusion of the race radio. The GC riders, and their teams, need to back off at the finish of the races. There isn’t enough space for all the sprinters, plus their leadout trains, and all the CG riders teams. It is physically impossible. Get rid of the radios and let the riders figure out how to stay safe on the course. A big part of bike racing is being able to read the race as it happens. That part is fast becoming history in this new age of electronics. To the riders detriment. The team directors need to quit playing Russian roulette with their riders. The sport is dangerous enough on its own. Here is a link to Bauke Mollema’s article at Cyclingnews. I agree with it nearly 100%. I’m not quite sure about moving the 3K rule out to 10K, but other than that, it is spot on. There is obviously only so much road for the peloton to use. The Tour could learn something from the other grand tours and put a mountain stage in the first week that seems to relax the peloton. While we’re on the subject the order of dangerous groups that race is WT, UCI, NRC, NCC, 1/2, 4, then 5s. I think the 3k rule needs to be moved out. I’m a little to lazy to find out when that rule came about but my guess it was before sprint lead out trains emerged. The rule was originally 1k, but it got moved back to 3k for just that, the team doing big leadouts. There was a fatal crash in a men’s road race at the World Police and Fire Games in Northern Virginia yesterday. Two other riders were seriously injured. The leading rider in the group of three had a front wheel puncture on a steep descent. He crashed as did the two others. A police rider from Brazil was dead on arrival. I am not sure of all of the details, but this is a reminder that any of us could lose our lives in the blink of an eye. Please, be careful out there. i like the idea of smaller teams. I think the tactics would change greatly. The GC contenders would be forced to race head to head on more stages. Breaks would be successful more often, and the race would be much safer. 6 man teams. 120 riders instead of 200. If they want to make things safer, they will need to make sure that the masters age riders are toward the back. Even though they are all pros, they need to emphasize the more junior riders and put them out front and out of danger. It’s important to keep the younger guys safe. The masters age riders not so much. They should also formulate a new pay structure that reduces the pay allowed in direct relation to rider’s time racing. In other words, if you are an older rider, you should be paid less than the newer and younger riders. It’s the only fair way to do it. It was implemented to promote safety by minimizing the GC teams involvement in sprint finishes. They were in the mix fighting for space to be sure their rider(s) dont loose time.